In January of 1941, Winston Churchill dined at a Glasgow hotel with his physician, Sir Charles Wilson (later Lord Moran ), and his secretary of state for Scotland, Tom Johnston. The other member of the party was Harry Hopkins, Franklin Roosevelt’s redoubtable unofficial ambassador and the American president’s most trusted adviser. Hopkins had been sent to investigate and report back in this hour of deadly peril for Britain, now standing alone in the battle against Nazi Germany. 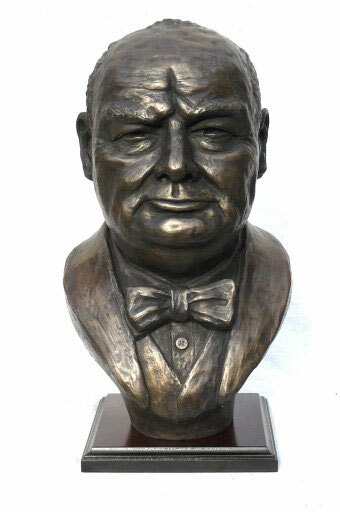 On Wednesday morning, a ceremony will be held on Capitol Hill to dedicate a new bust of Winston Churchill, to be on permanent display in the Capitol Building. House Speaker John Boehner, whose office conceived of the project, will serve as host for the occasion, advertised as bipartisan, with former speaker Nancy Pelosi and Sen. Harry Reid expected to attend. The subject of Churchill busts has a certain resonance—recall the disappearance of the one that had adorned the Oval Office until Barack Obama’s election. The planners of Wednesday’s event—which came to pass via House Resolution 497 authorizing a Churchill bust to be placed in the Capitol—are assured that this one won’t disappear. The resolution, introduced by Mr. Boehner and unanimously passed in December 2011, marked the 70th anniversary of Churchill’s 1941 address to a joint session of Congress. That address, barely three weeks after Pearl Harbor, drew a packed house which included Supreme Court justices and cabinet members, who hung on the prime minister’s every word and gave him a roaring ovation…. I had missed Keith Koffler’s earlier report. Like Rabinowitz, Koffler observed that the installation of the Churchill bust as “a certain resonance.” He calls it “a direct rebuff to President Obama’s decision to remove a bust of Winston Churchill from the Oval Office[,]” as indeed it is. “The bust,” he notes “which will be donated by the U.S.-based Churchill Centre, will be located in Statuary Hall alongside great figures in American history.” Thank you, Speaker Boehner. The expression of gratitude for a debt owed is a form or aspect of justice. It does honor to those who confer the recognition as well as to him who receives it.